During my time at UKOLN there have been several core funders including BLRIC (British Library Research and Innovation Centre), LIC (Library and Information Commission) , Re:source, the MLA (Museums Libraries and Archives Council) and the JISC. Having joint funding has meant that UKOLN was able to engage with not only the higher and further education sectors but also the wider library community together with, following government reorganisations, the cultural heritage sector. In recent posts I summarised my involvement in speaking at and organising events and writing a large number of peer-reviewed papers. This work was carried out primarily through UKOLN’s core funding. The work typically sought to address the needs of our communities through the involvement with people working directly within the sector. Such ‘customer’-focussed approaches helped, I feel, to ensure the work was relevant to the sector. My work which was more directly involved with JISC’s needs began with work in developing documents on open standards of relevance to JISC’s digital library programmes, beginning initially with the eLib programme and followed by the DNER and the JISC Information Environment. This work led to related work for the cultural heritage sector, in particular providing advice on standards for the NOF (New Opportunities Fund) Digitise programme. In addition to such core-funded work I was also involved in project-funded activities including the JISC-funded QA Focus and JISC PoWR projects, the BLRIC-funded WebWatch project and the EU-funded Exploit Interactive and Cultivate Interactive ejournals. I was also involved in a number of initiatives driven by JISC such as the eFramework but, as described in Andy Powell’s post “e-Framework – time to stop polishing guys!” the time and effort expended by this international partnership failed to have any significant impact and the eFramework Web site seems to be no longer available although a copy is available in the Internet Archive. One area which was of particular interest to both of UKOLN’s core funders was the selection of open standards for use in development programmes which they funded. 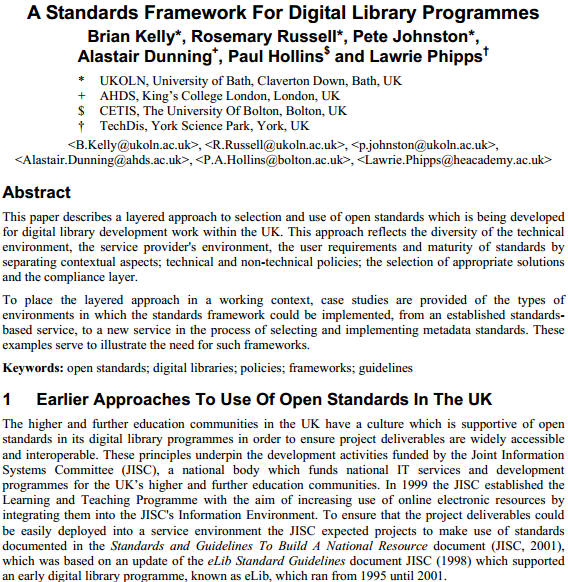 My initial work in this area involved contributing to a document of the open standards relevant for the eLib programme. This subsequently led to similar documents being developed for the JISC Information Environment and the NOF-digitise programme. The aim of the QA Focus project was to develop a quality assurance (QA) methodology which would help to ensure that projects funded by JISC digital library programmes were functional, widely accessible and interoperable; to provide support materials to accompany the QA framework and to help to embed the QA methodology in projects’ working practices. The QA framework is a lightweight framework, based on the provision of technical policies together with systematic procedures for measuring compliance with the policies. The QA Framework is described in a number of the QA Focus briefing documents and the rational for the framework has formed the basis of a number of peer-reviewed papers. This lightweight framework was described in a briefing document. In brief rather than mandating open standards which must be used across all of JISC’s activities, the framework recommended that projects should document their own policies on open standards (and related areas) and the procedures to ensure that the policies were being implemented. JISC programme managers would have flexibility in prescribing specific open standards if this was felt to be appropriate (for example, a programme designed to investigate the value of the OAI-PMH protocol for harvesting repositories could legitimately mandate use of OAI-PMH, and perhaps even a specific version ). This approach meant that JISC could request that project reports should be provided in MS Word or PDF formats – both of which were proprietary formats at the time (although they are now both open standards). It also provided the flexibility in avoiding mandating open standards prematurely (e.g. insisting on use of SMIL rather than the proprietary Flash format) or mandating open standards when design patterns may have been more appropriate (e.g. mandating the Web Services standards such as SOAP when RESTful design practices have, in many cases, proved to be more relevant). … despite the widespread acceptance of the importance of open standards, in practice many organisations fail to implement open standards in their provision of access to digital resources. It clearly becomes difficult to mandate use of open standards if it is well-known that compliance is seldom enforced. Rather than abandoning open standards or imposing a stricter regime for ensuring compliance, this paper argues that there is a need to adopt a culture which is supportive of use of open standards but provides flexibility to cater for the difficulties in achieving this. describes a layered approach to selection and use of open standards which is being developed for digital library development work within the UK. This approach reflects the diversity of the technical environment, the service provider’s environment, the user requirements and maturity of standards by separating contextual aspects; technical and non-technical policies; the selection of appropriate solutions and the compliance layer. To place the layered approach in a working context, case studies are provided of the types of environments in which the standards framework could be implemented, from an established standards-based service, to a new service in the process of selecting and implementing metadata standards. These examples serve to illustrate the need for such frameworks. Further papers on “A Contextual Framework For Standards” (by myself, Alastair Dunning, Paul Hollins, Lawrie Phipps and Sebastian Rahtz [OSS Watch]) and “Addressing The Limitations Of Open Standards” (by myself, Marieke Guy and Alastair Dunning) and “Openness in Higher Education: Open Source, Open Standards, Open Access” (by myself, Scott Wilson [CETIS] and Randy Metcalfe [OSS Watch]) subsequently developed these ideas and explored how they could be app;lied in a variety of contexts. Looking at this work it strikes me the value of the expertise provided by colleagues across the sector. The papers I have listed which described the approaches and ensured that the ideas had been subject to peer review work were written by staff at UKOLN (4 individuals), CETIS (1 individual), OSS Watch (2 individuals), TechDis (1 individual and the now-defunct AHDS (2 individuals). JISC programme managers provided value project management support for the initial QA Focus work and gave early feedback on the ideas but did not have intellectual input into the ideas. In light of the evidence given in this blog post I am somewhat concerned with the new logo which appeared on the redesigned Jisc Web site: “We are the UK’s expert on digital technologies for education and research“. Really? What is the evidence for that assertion? Wouldn’t it be more appropriate to say “We are successful in designing development programmes and providing project management expertise to these programmes“? And equally important “We are successful in encouraging the experts in the higher education sector to work together for the benefit of the wider community“. I would be the first to give thanks to the JISC for organising events which enabled me to meet the co-authors I’ve listed above and encouraged such joint working. But “We are the experts”! Who coined that statement, I wonder?